Tickets are going fast! For best seat locations, purchase your tickets now! Take this brochure to friends, family, neighbors, co-workers, and anyone else you can think of. The best part is that a portion of every ticket purchased will go directly back to your school! The more tickets you sell, the more prizes you will accumulate! See the next page for all of the amazing Pacers prizes you could earn. 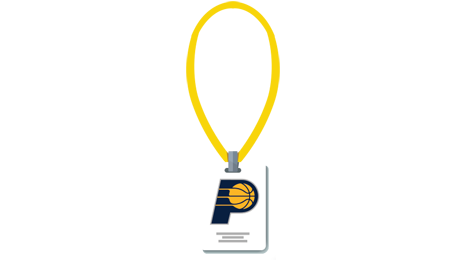 Receive a digitally autographed Pacers card from one of the starting 5. On your school night, enjoy early access to the fieldhouse and watch from courtside seats as the players warm up. Must sell at least 10 tickets to be eligible for 2 complimentary tickets. Complimentary tickets are good for your SCHOOL NIGHT ONLY. 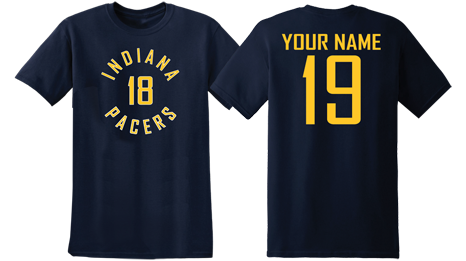 Size Options: YM (10-12), YL (14-16), Adult Medium, Adult Large Receive a one of a kind personalized Navy Pacers T-Shirt with your name on the back. 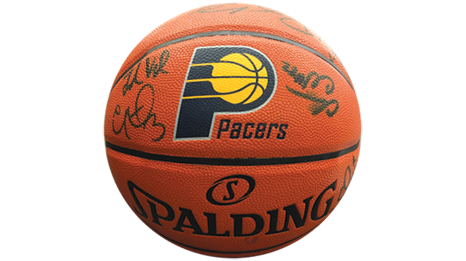 Receive a signed basketball from the 2018-19 Indiana Pacers team. 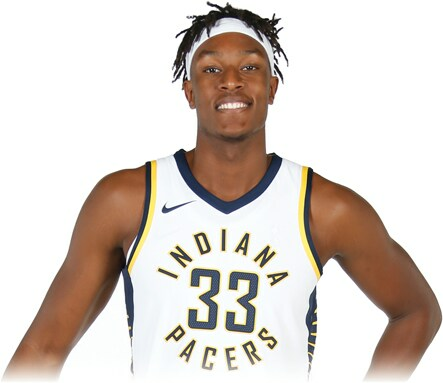 Two (2) Lower Level Tickets to a future Pacers game, dinner for two (2) in the Varsity Club Restaurant prior to the game, and a post-game private tour of the Pacers Locker Room. 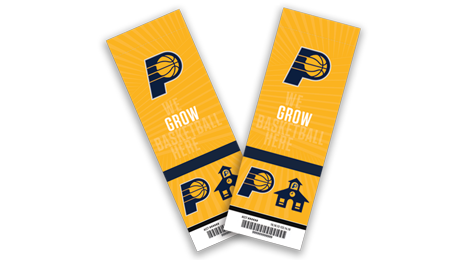 Sell the most tickets at your school and you'll receive two free tickets to an additional Pacers game! You'll also have the opportunity to join Boomer and the Pacemates post-game as we take a picture and Cut Down the Nets! Honorary Team Captain Experience – deliver the game ball to the referees and meet with the team captains at center court just before tipoff! Watch the game from a private luxury suite with food & beverage provided! If you purchase tickets online through this website, e-tickets will be sent straight to the e-mail address you provide 1 week prior to the game date. If you purchase tickets by filling out the physical order form located on the back of the brochure, your tickets will be sent to the student who sold the tickets to you, and the student will distribute those tickets in plenty of time prior to your game(s). How do we receive our prize(s)? Prizes will either be mailed back in your student packets or a Pacers School Fundraising Program Representative will connect with you to ensure your student receives their prizes. 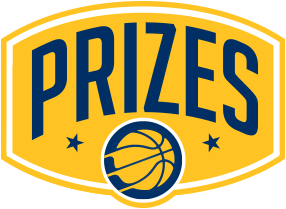 If you have questions about receiving your prize(s) simply contact our Group Sales Department at (317) 917-2827 (OPTION 2) or email aball@pacers.com. Where will I be sitting? We have 4 seating options through our School Fundraiser Program. Each option is discounted compared to the single game price. You can choose from our Balcony, Krieg DeVault Club Level, or Lower Level. To see all of the options, click here. Please note: while we do our best to keep everyone from the same school sitting close together, we cannot guarantee for that to happen for each game. We try and reserve large blocks of tickets for our School Fundraiser Program to keep everyone sitting as close together as possible, but it's not always feasible for us to make those accommodations. What do I do if I need wheelchair accommodations? If you are purchasing tickets through the physical brochure, simply make note of it on the order form. If you want to purchase tickets online, there is an option to select wheelchair accessible seats. 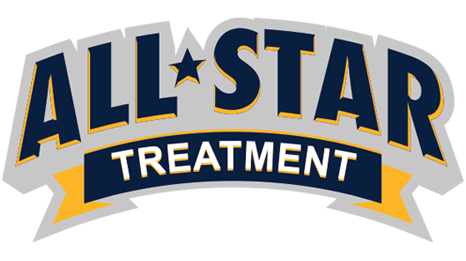 If you need additional accommodations, feel free to call our Group Sales Department at (317) 917-2827 (OPTION 2). How much money is going back to the school? Why are tickets online more expensive than tickets through the brochure? Any tickets purchased online are subject to a small convenience fee. This fee can be avoided if you purchase tickets through the Pacers School Fundraiser Program brochure. 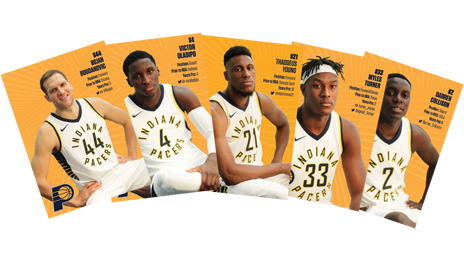 For all other questions, please reach out to our Group Sales Department at (317) 917-2827 (OPTION 2) or email aball@pacers.com. *Please note: Check presentation is on your SCHOOL NIGHT ONLY and will not be offered at any of the 3 alternate games. 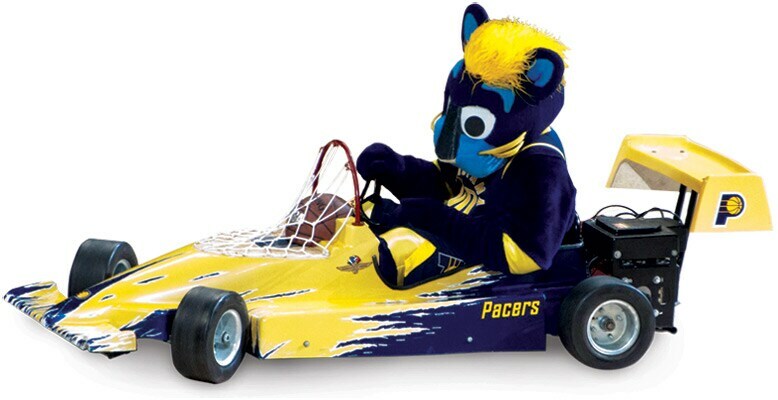 ***Grand Prize Guidelines: Student must sell the most tickets in the entire program and all tickets must be sold through the Indiana Pacers School Fundraiser Program. All school night and alternate night tickets will be counted regardless of price. Order forms cannot be combined, and any order received after the deadline will not be eligible. Date of game and Grand Prize experience to be determined by Pacers Sports & Entertainment.